The Decatur Diner is again for sale! 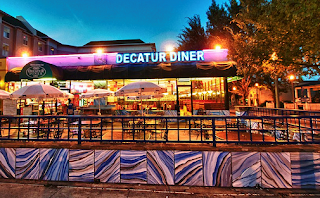 The Decatur Diner was first announced to be opening in the former Atlanta Bread Co. space at the intersection of E. Ponce de Leon Avenue and Church Street in April of last year. After countless delays and a horrible exterior paint job, the 24-hour eatery finally opened in early February of this year. Having heard about the bad business practices of the restaurant's ownership including failure to vendors and employees at other locations, I reported that their Empire Diner in Sandy Springs was "Closed Temporarily," which turned out to be permanently. (Egg Harbor Cafe will soon open in the space they vacated.) Even before opening for more than a day, Decatur Diner earned a place on the DeathWatch in January and maintained its position until now. Late last month, Decatur Diner was sold to a man with prior restaurant experience, but none in the full service segment. As a result of his inexperience, he has decided to put the restaurant back on the market. So there you have it: the Decatur Diner is somehow still open, for now, but is available for sale for the second time in less than a month. Given the recent openings of No. 246, Cakes & Ale and Sapori di Napoli, hopefully some (experienced) restaurateur will find this location too good to pass up and open something wonderful. Do you have an idea for what should open in place of Decatur Diner? Do you think the diner could do well with new, experienced management in place? Do you miss Atlanta Bread Co.? Please share your thoughts and suggestions in the comment section below. Maybe West Egg can open up a Decatur location? Fifth Earl should come back to Decatur! I miss Atlanta Bread Company a lot! Maybe Panera could come to this busy location. Bring back the Bread Co. or Panera, absolutely! Or (wishful thinking) Mick's -- I really miss that place. Decatur Diner has been under new ownership since Nov. 1st 2011. Finally those nasty people are gone and hopefully the new owner will make it right. My thoughts are precisely the same as a previous post-i.e. "Bring back the Bread Co. or Panera, absolutely! Or (wishful thinking) Mick's -- I really miss that place". The Patio would be perfect for Mick's.